Since I figured I wasn't busy enough with all our renovations, I've also been working a little side project....I'm making a rug for our living room. I started during the first few weeks we owned the house, before the asbestos was removed and we couldn't do much. After that I worked on it while we were staying at Mum and Dads, particularly during the week we had to wait for the floors to cure. Since then I work on it every few nights depending on what else I've got going on (at the moment, cleaning a lot of paint flecks off the floor because I wasn't as careful as I should have been painting the skirtings!). I got the idea from various Google Images and Pinterest searches for DIY rugs, I knew the look I wanted but didn't find any affordable rug I liked anywhere. 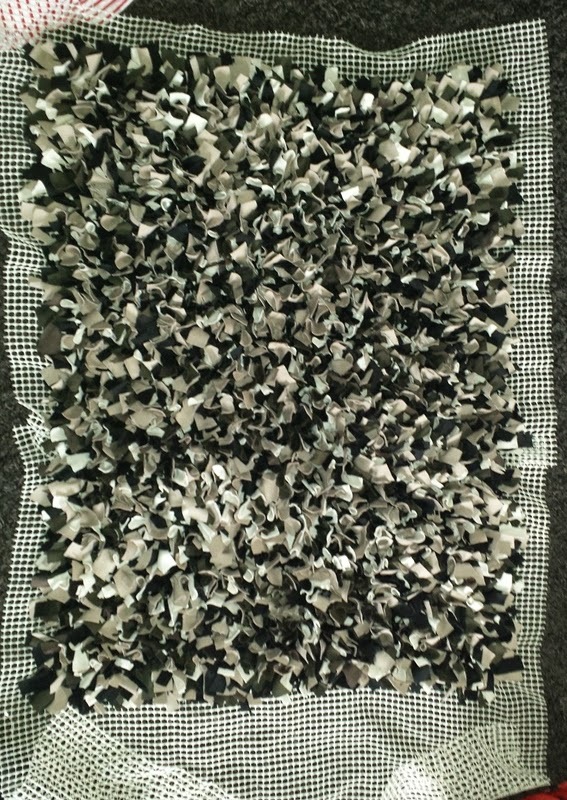 In the end this post from my love of style gave me my true inspiration and made it sound easy enough to make a shag rug myself. 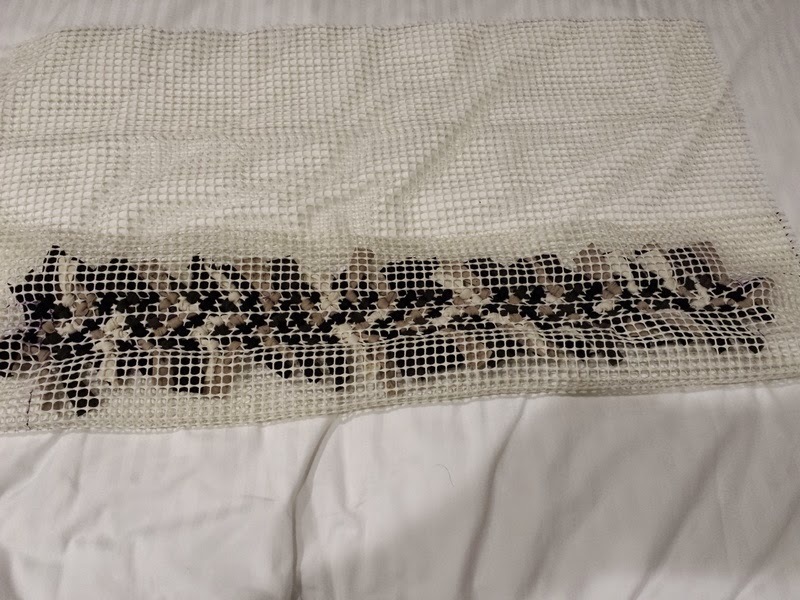 I actually made a trial rug first, about 40x60cm just to see how long it would all take. 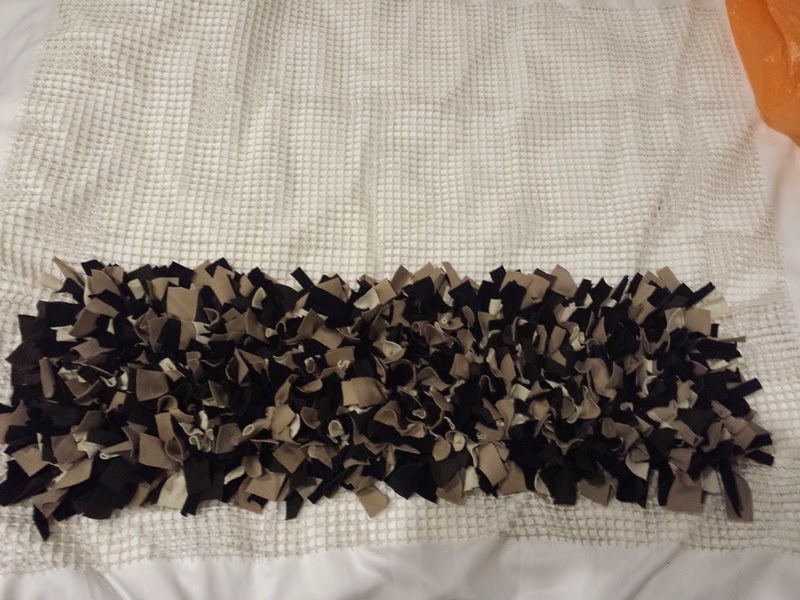 I've made the rug using different quantities of black, brown, tan, cream and olive green fabric. Double knit or ribbing, with the highest percentage of cotton I could find. Some polyester material I tried curled in a way I didn't like and felt squeaky rather than soft to touch. I've used a few hundred dollars worth of fabric, I can't be accurate because I need to find the receipts and the rug isn't finished just yet. It has an obvious chunk missing, but I also want is at least 30cm wider than it currently is. I have bought over 30 metres worth of fabric though and it cost between $5 and $15 a metre (so somewhere around $300-400 worth). - cutting the strips is the worst part, if you find a shortcut, use it! - I needed a tricky pattern to work for my mixed quantities of fabric (so I hopefully don't run out of one too early) which I then had to change part way through when I couldn't get more of one of the colours. This has led to many frustrations, fewer colours in a simple 1:1 ratio would be much simpler. My pattern (which repeats every 54 knots) still looks quite random, but that was deliberate. 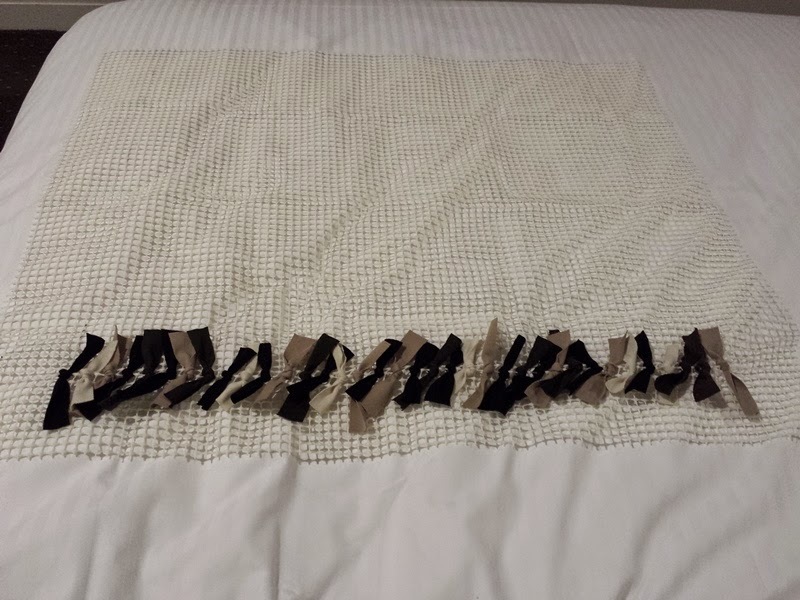 - Slightly different lengths of strips also changes the appearance of the rug, some colours are more dominate in some rows before I cut strips slightly longer etc. 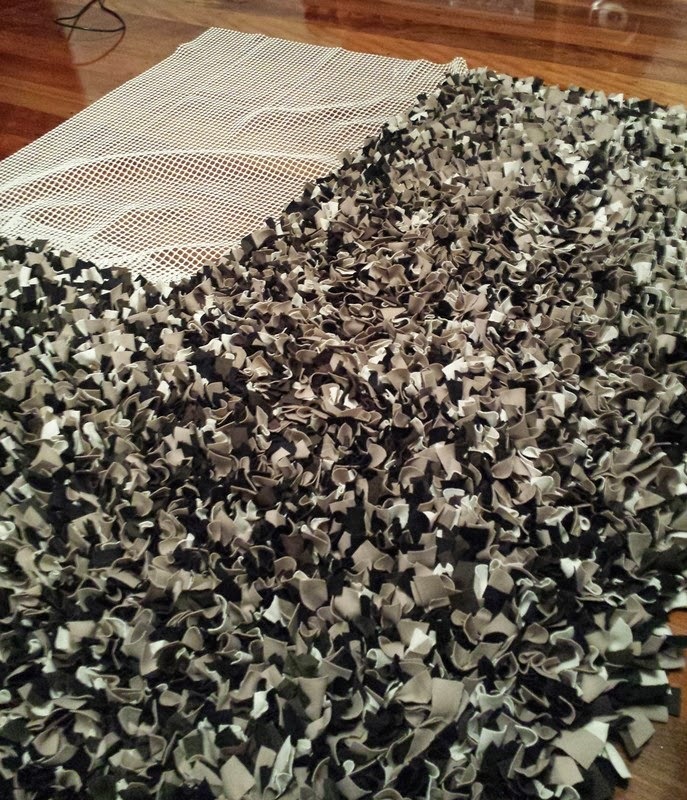 I may do some editing of the rug when it's finished and cut down or replace strips to even it up a bit. - It takes me about 20mins to tie 50 knots, but that includes selecting the right order which slows me down. Getting into a rhythm it moves much faster, having to stop to cut more strips it moves much slower. - My strips are generally about 1.5-2.5 cm wide and 10-13 cm long. Early on I measured them, now I just go by eye as it's much faster. I also cut as many layers as I can at once. 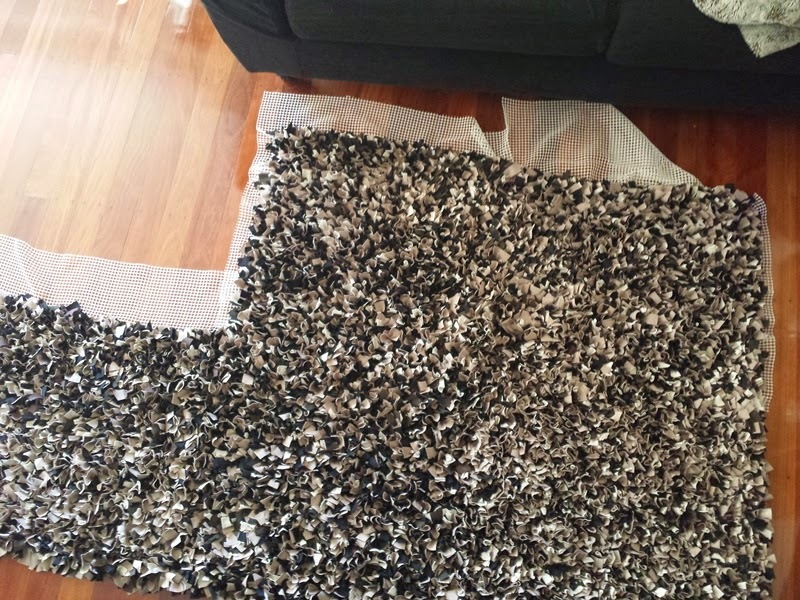 - I used flexible rug non-slip thingys as my base, I picked them up in 70cm x 80cm sizings from Danda for $2.80 each, I think Daiso has some similar. - I tied the knots in a 3:1 ratio for rows (as in three rows tied, one row gap) as I found it worked best for the thickness I wanted. I'd give it a trial depending on your fabric. 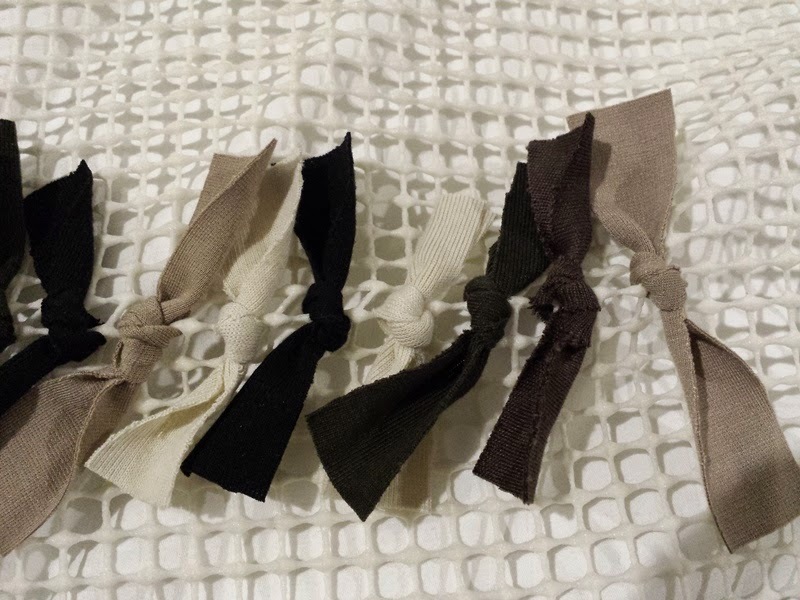 I also tied every other knot across the row rather than into the same holes...if that makes sense. - I also tied my knots by hand, no tweezers or pull thingy. I usually just rolled the end to poke it through and worked from the back of the rug flipping it over to tie the knot. 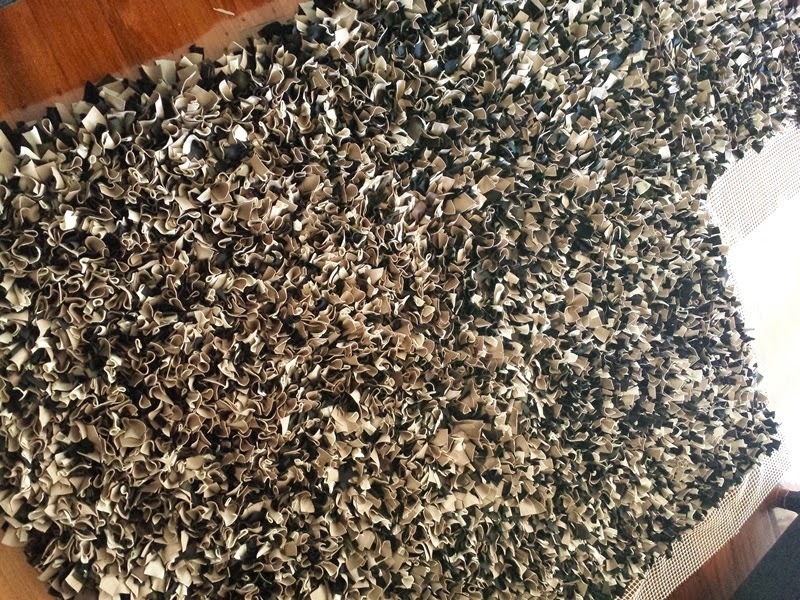 Now the rug is getting big, I usually poke through quite a few bits before flipping it over to tie all the knots. It's heavy! - I'll be very glad when it's finished. The first 'panel' almost complete. To join the different pieces, I just over lapped them and tied the knots through both for 4-5 rows. Nearing the end of the second panel, already joined to the first. 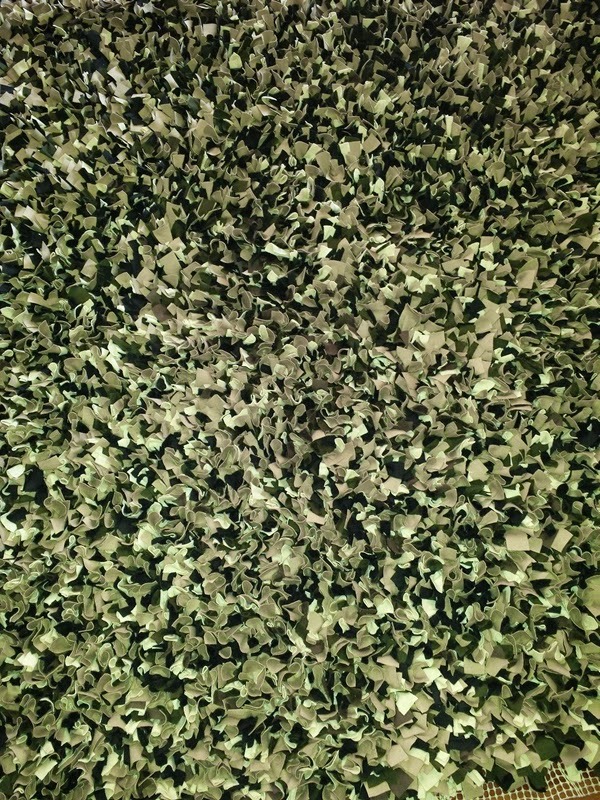 A 'birds eye' view of the rug where I'm currently at. It's now way too big and heavy to transport anywhere. I work on it upside down with it hanging over the side of the couch. Thanks! I'm actually itching to get back into it, haven't worked on it for a few weeks when I've been busy painting and organising. I have to cut another big batch of strips so I need to dedicated a bit of time. Really hope I can post a completed pic soon! You must be so patient! It looks great though... And I bet it feels even better that you made it yourself instead of buying it.